Your lockpickWORLD 10% one-time discount code and instructions are located on the orange image, and it's repeated below our lock pick recommendations lower down this page. 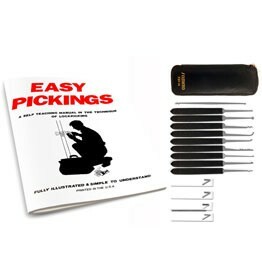 Here's a short list of recommendations for lock picks for newcomers seeking to learn how to lock pick - if you know exactly what you're looking for - please visit our website instead, or use the search bar at the top. Clicking on any Buy Now button will take you to your shopping cart on our website. 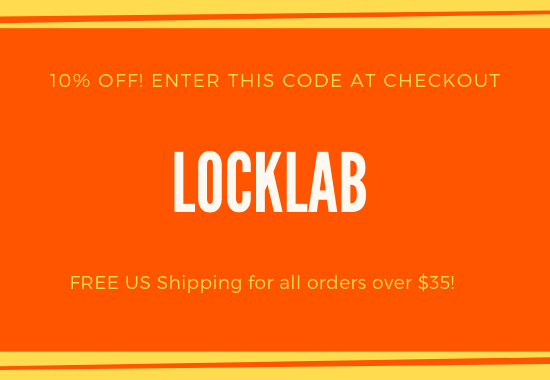 Just enter your Locklab discount code at the last page of our checkout. Our criteria for this list is cultivated from experience, but primarily we choose sets that are professionally manufactured, reviewed well by experts or hobbyists, and that they get delivered to you within 2 - 6 days once ordered (depending on your state of course!). Ultimately, the final choice is yours, we're just here to make your life a little easier as we've been doing this for a while and we hope that our views bear some weight! Let's begin. Don't forget that practice makes perfect - and what better way to get started than to include a good selection of practice locks to go with your picks. This way, you'll be learn to better visualize the inside of the mechanism and be able to pick locks much more successfully. Electric Lock Pick Guns - The fast way to pick locks? Want to know what all the hype is about lock pick guns? Essentially, there are three types of pick gun. And they aren't actually guns - they are just a kind of power tool. Through clever technological application of a vibrating motor, they're particularly good at jiggling the pins in locks so you very often reach a configuration that allows you to open them without a key. Why do you need this if you have manual lockpicks? Well, in the same way that having more picks gives you access to more types of picking, and having more types of picking allows you a greater range of options for success ... this is just the same. When you don't want to damage and replace the entire door, hinges or whatever else - lock picking is always the first primary method we choose. Another versatile tool that again further improves the probability that you open a lock without having to cut it out expensively, or damage whatever door the lock is holding closed. We'll be introducing just the fully automatic electric pick gun here, but you can read about or browse the rest on lockpickWorld. We know that the current most popular and recommended EPG is the German manufactured Kronos. There's a certain benefit to knowing that your automatic picking tool is made with reliable German craftsmanship and technology. Quality, effectiveness and superior service - this matches perfectly with what LockpickWorld stands for and how we love interacting with you, our customers. 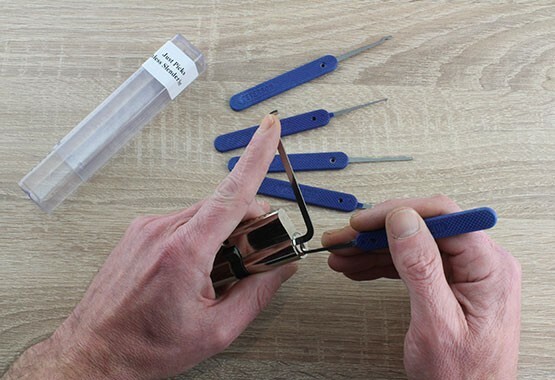 The Praxis picks have been reviewed as Bill’s set of choice, and will take you from the start of your journey and give you a professional lock picking head start. Watch the video of his review to learn more about why they're so good! The perfect lock pick set for a dedicated lock picker. We sought the experience and knowledge of professional and world-champion lock pickers around the world when devising this set, and have created something both unique and devastatingly effective. These are sixteen of the finest picks supplied in two thicknesses for all kinds of locks. You get both slimline, and ultra-slimline in a smart camo case - all extremely solid and with a range of tension tools that perfectly compliment this professional selection. If you'd like to practice more effectively, we highly recommend adding a clear training lock too. 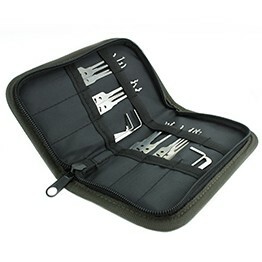 All you need to get started with a pick set and a case that holds your lock picks in place. See our whole range of reviews about the Dangerfield Praxis set from satisfied customers. This makes a great gift. Just add a practice lock and maybe some handles and you're good. One of the most frequent questions we are asked is “What’s the best set for a beginner?” That question was finally answered for the last time when designing the Serenity set. An introductory lock pick set needs to be punchy, compact, no-nonsense and high quality. These are the core defining qualities of this set. But more – we wanted to make a beginner lock pick set that didn’t need to be replaced, one that would last well into the future. There’s no reason a starter set needs a shelf-life. 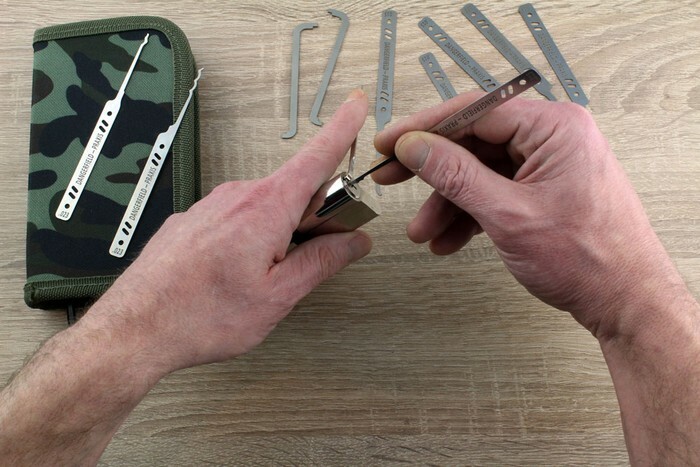 The Serenity lock pick set offers an affordable popular and professional collection of useful lock pick tools and wrenches picked out specially for you, complete with a leather wallet to hold all your tools. Just add a Clear Training Lock and you can get started instantly. 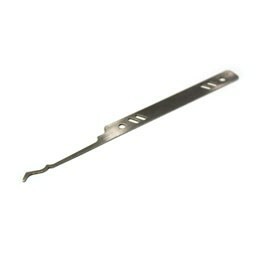 SouthOrd has long been a reliable name in lock picking quality. These are dependable, well designed picks that have stood the test of time and are manufactured in the US with american steel. The SouthOrd PXS-14 beginners set contains a great range of picks and tension tools in a sturdy, protective wallet, with comfortable grips for those wanting a more ergonomic feel. 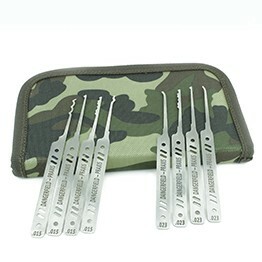 This is a consistent, best-selling lock pick set that will compliment your developing skills perfectly. Just add a clear practice lock and you'll be good to go whatever your level. 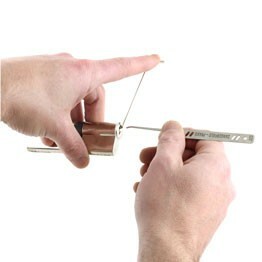 If you’re totally new to lock picking, the choices available to you can be daunting. We often recommend this particular set to newcomers. You can get started and educated about picking and understanding locks in under an hour. The Lokko Beginner lock pick set box contains an instructional ebook guide (which you can upgrade to a real book if you prefer flipping through paper), clear, transparent practice locks, normal lock picks with comfortable handles and a set of spy credit card covert picks in a great looking boxed set – everything you need to challenge yourself and deal with those locks immediately. If you want to challenge yourself even more by adding more great locks - we highly recommend the Dangerfield Triple set of locks. So - this is a lot of lock picks, and it's designed for every situation you might think of coming up against. Think of this like the toolbox full of solutions. Except it's a gorgeous tactile, leather roll-up wrap case full of lock picking solutions. How is this particular set different? 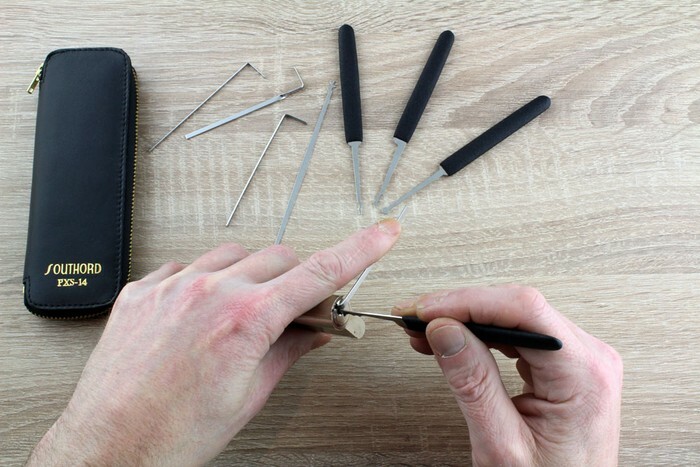 Well, each stainless steel pick is individually designed and crafted by Multipick, a German locksmith tools specialist to produce the last word in professional lock picking craftsmanship. Owning this pick set puts you among the world elite of lock pickers, allowing you entry into an unspoken and unnamed club for people who have all the tools to realize the locksmith and amazing picking skills they wish to develop. Pure quality design, engineering and workmanship, protected in a real leather wrap-up case that unrolls to present this elegant and meticulous selection, ready for endless effective lock picking. Eight years ago I got my Slimline SouthOrd 22 piece pick set. Today, it's as fresh as ever and still my go-to lock pick set. Pulling the zip on the leather case is like opening a box of delights, the impeccable design and professional quality simply glows. This set screams confidence and is a pleasure to use and own. Superb American engineering and expertly designed, this is a complete, and serious set of picks for the serious lock picker. We recommend getting a practice lock or two with this so you can improve your abilities. In the C2010 kit all picks except for three are a practical thickness at 0.022". This difference gives you a range of versatile options for whatever lock you encounter. 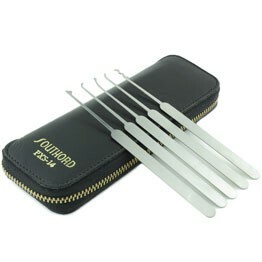 This set also comes highly recommended, and all SouthOrd products come with a standard guarantee of total satisfaction. Order it today and get it with Free and fast delivery. Peterson's lock picks are known for their attention to detail, especially the small differences in the picking surface that can make all the difference. The angle of the cut, the curve of the neck - when using Peterson picks you know they have been designed by people who pick locks. This was Peterson's first offering of slender government steel picks to allow working within narrow key ways. Based on their thinness they kept them at a standard profile for strength. This set of Peterson's 0.015" picks contains 5 of Peterson's most popular profiles. The perfect addition to any pick set. Just slip them in with your favourite set and instantly make it a superior set. Tough as nails and laser precise. The Lamborghini of Jackknives for lock pickers. When classic design meets precision engineering, the result is the the finest quality and style possible. That feeling of confidence knowing you're working with the highest possible standard of German craftsmanship and 301 Stainless steel - a perfect combination to pick locks. Slick, eye-catching, and desirable, the Multipick Blackline Jackknife lives up to its hype by providing covert lock picking functionality with designer curves and impressive kinetic performance. Cut from a single block of aircraft-grade aluminium for continuity galvanized and treated with micro-finishing for durability, it comes with micro-magnetic blade fixation - the picks cannot slip out. Stay prepared to pick locks in any emergency and remain covert. Perfect. 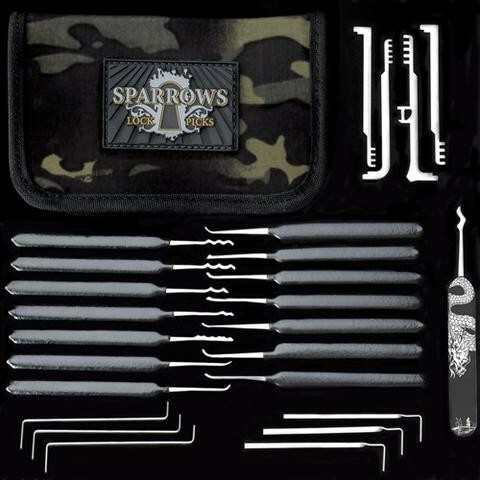 The Sparrows Vorax set offers a complete selection of professional rakes, picks and tension tools for the serious Single Pin Picker and lock Raker. Combining years of experience and design into one set, the Vorax provides serious lock picking ability with style, premium manufacture and attention to detail. This distinct and impressive set is the definitive all-in creation of professional lock pickers who demand quality and precision design. This Canadian Lock Picking manufacturer sure knows how to make sets for picking locks, and their exclusivity means you should definitely check them out. While pricey, and a little behind Multipick and perhaps Dangerfield in quality - they're still up there on our list of top sets. 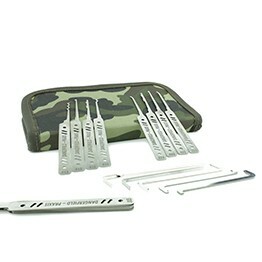 Five Star Video Review of the Praxis Lock Pick Set! Bill recommends this as his go-to pick set. Find out why! This is a great beginners set. It has a little bit of everything and comes at a great price. Still working though the ebook but so far I am very satisfied with the purchase. I'd had some experience picking locks laying around but this was my first purchase of a targeted training lock. The acrylic is neat to see what's going on while working a given pin. Great products and awesome service!! The Southord PXS-14 is a great beginner set, customer service is the best! I ordered a practice lock with the lock pick kit, both arrived a day early! One last thing - We usually also recommend that if you are starting out, you also look at our collection of training locks to get you started. 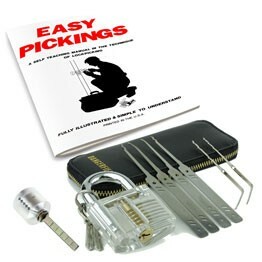 This bundle is ideal if you want a great price when getting practice locks to improve your dexterity and skill. A clear, see-through double-sided practice lock with visible mechanism + keys: get double the practice easily. 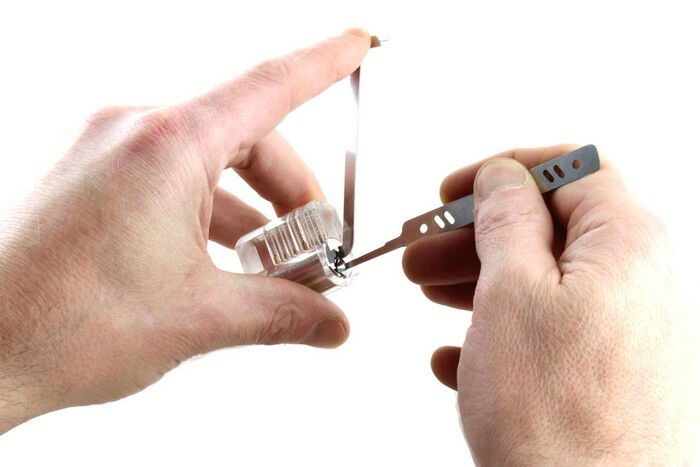 A unique crystal-clear practice lock with keys, again ideal for training with your picks. This lock is a joy to hold and we have customers buying it just for decorative purposes. It's just that well crafted. Whether you're after a series of great practical puzzles or just something to keep your brain active - this practice lock bundle is perfect for expanding your picking collection... or just for displaying on your desk to impress your friends! More locks = more fun. Keep your hands occupied while you multitask! Picking locks becomes zen-like, but only after a worthy struggle. Discover TOK wrenches, vices, repinnable locks and more. After Bill made a video reviewing Multipick's Kronos EPG very positively, demand for our vibrating, lock-opening power tool went wild. This is the most talked about EPG ever! Our best-selling one too. There's a particular feeling of confidence when you know you're carrying the power to open most of the world's locks in the palm of your hand. That's the kind of quality we've come to expect from Multipick, and with the Kronos, they've raised the bar again. Pure lock opening power at your fingertips. The professional lock opener really can't afford to be without one. I've used all of the available EPGs on the market and the Multipick Kronos is by far the most effective. This beautiful, almost silent lock picking machine is a pleasure to own and use. It eats locks for dinner. This tool is a weapon in the war on locks! Designed, engineered and manufactured in Germany for exquisite professional performance. And absolute dream to use, a pure lock-opening machine. We recommend that you try this out on one of our transparent practice locks first, just to make sure you are using your high-end equipment correctly. This is one of our most recommended items, it functions and looks amazing! The summaries above of our time-tested and recommended lock pick set options will help you narrow down your choices. These are the picks we have used, the ones we supply to hobbyists, professionals, locksmiths, the military, police and other key servicemen, as well as world champion locksport pickers! We also design, manufacture and routinely use many of the picks we sell, and our customer reviews speak volumes about our years of trustworthiness and service, as well as our great prices and Free US Shipping over $35 (and our free how to pick locks eBook!). What better way to educate yourself about locks, tighten up home security and challenge your brain? Along the way, you'll improve your IQ, lock knowledge and manual dexterity! Do you want a learner set or would you prefer a more professional set? That's it - now you have all you need to decide! Please Share This if you think other friends member might enjoy a read (or the discount)! Just type in the code LOCKLAB at the checkout to get 10% off your order. 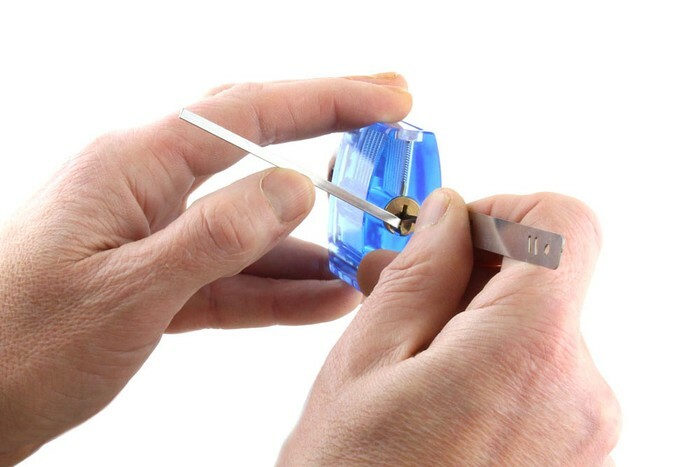 If you think you're ready to buy - we provide fast and free delivery, great after-sales service and a 100% money back return guarantee if you aren't happy with the quality of our lock picks! Our hundreds of satisfied customers speak volumes about our expertise and ability to teach you this great, new and useful hobby. Stop breaking and destroying things, learn to finesse them open skillfully and effectively instead with our quality, curated tools.